Taste of Wicklow Launch 2018, Left to Right: Paul Kelly, Executive Pastry Chef of The Merrion Hotel; Paul Smyth, Head Chef of The Mystic Celt; Robert Kelly, Store Manager of Gallagher's SuperValu; Robin Bradley, President of Wicklow Town and District Chamber; Pascal Burke, Taste of Wicklow 2018 Chairman; Alan Hegarty, Owner of The Lighthouse Restaurant; Diana Sheridan, Taste of Wicklow 2018 Committee Member; Tomasz Wzrobel, Head Chef of The Lighthouse Restaurant. Celebrity Chefs Kevin Dundon, Catherine Fulvio and Paul Kelly were in Wicklow Town today for a photoshoot to launch Taste of Wicklow Food Festival which takes place on 1st July along with local chefs Paul Smith from The Mystic Celt, and Alan Hegarty and Tomasz Wzrobel from the Lighthouse Restaurant. The Taste of Wicklow is now the biggest Food Festival in the South East. 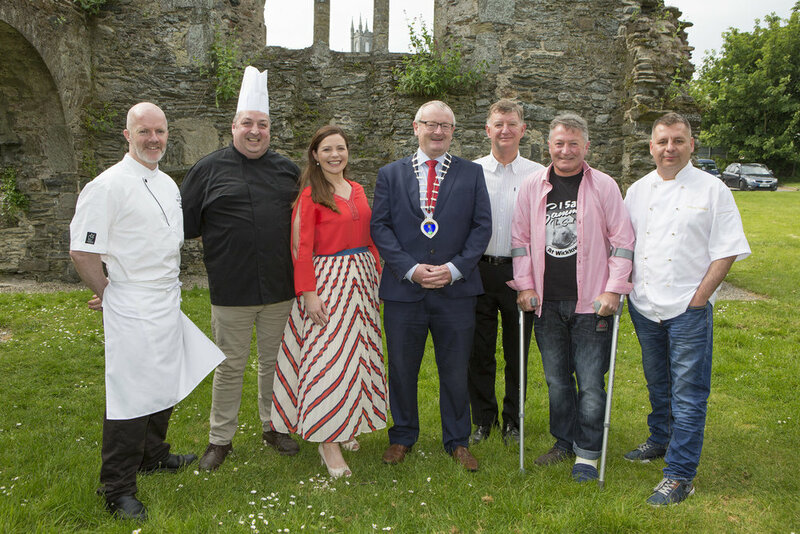 The Taste of Wicklow Food Festival now in its 6th Year will be held at the stunning Abbey Grounds, Wicklow Town and with its star-studded line up of celebrity chefs is sure to attract record crowds again this year. On Saturday 30th June a wonderful weekend in Wicklow Town kicks off with the start of the Round Ireland Yacht Race with a full programme of family entertainment at the historic Black Castle. The festivities continue with a variety of national and local talents ready to put on an unforgettable show sure to electrify the crowd starting from 5pm – 10pm. The programme features Cafolla & Engel, Seo Linn, Music Generation Wicklow, Look to The Lady, and Xquisite Dance - five acts that are no strangers to putting on powerful performances. The Music program is sponsored by K&K Windows. On Sunday celebrity chefs Catherine Fulvio, Kevin Dundon and Paul Kelly together with local chefs will be cooking up a storm throughout the day with masterclass demonstrations — if you fancy yourself as the next Gordan Ramsey you can't miss this! For the 6th year running, The Taste of Wicklow is proudly sponsored by Gallagher's SuperValu Wicklow and is organised by Wicklow Town & District Chamber. The programme will feature over 30 artisan food and craft stalls who have been tweaking their delicacies for months just for this moment, and can't wait for you to sample the absolute best in food that Wicklow has to offer. Entertainment for the whole family is guaranteed as a packed schedule of free entertainment will be running for all the family — face painters, children's games, entertainers, puppet and circus shows, to name just a few of the activities. Speaking at the photo call, Wicklow Town & District Chamber President Robin Bradley said: "Now in its sixth year, The Taste of Wicklow Food Festival has become the standout social event of the year in Wicklow Town and this year sets out to promote all the food producers in County Wicklow." A buzz is brewing in Wicklow Town, as local businesses and people can't wait to showcase why you'll want to keep returning to Wicklow all summer long. Early Bird Tickets are available online at www.tasteofwicklow.ie, but act fast as the tickets are rapidly running out — once they're gone, they gone.